A pair of students walk home from summer school over the Haddon Bridge. 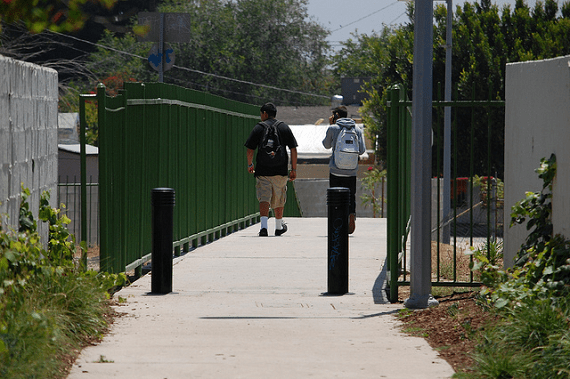 Last year, literally hundreds of students had to cross the Haddon Bridg everyday to get to class at San Fernando High School. Locatee on the north west side of Ritchie Valens Park crossing the pedestrian bridge was literally the worst part of the day as it was both somewhat secluded and a complete eyesoar. The paint was chipped and non-existent, the side nearest the park was used as an illegal dumping ground for electronic and hazardous household waste, and the other side often featured a gang member either harassing or recruiting the students. That’s a pretty crappy way to start the school day. And at least one student who needed the bridge more than others couldn’t access the bridge because of the poorly placed bollards. Without help of family of friends to lift her wheelchair over the bollards, she had to travel over a mile around the Wash to get to school or visit her grandparents. They live one mile, and a world, away. 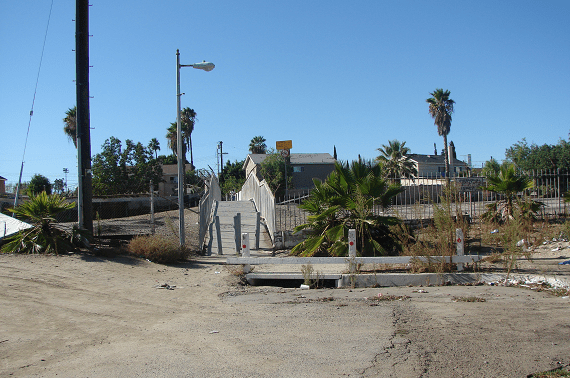 In an effort to improve the community, and provide a micro-example of what can be done with the Wash, Pacoima Beautiful used $20,000 from its PLACE Grant and a heaping of community involvement to re-imagine the bridge. 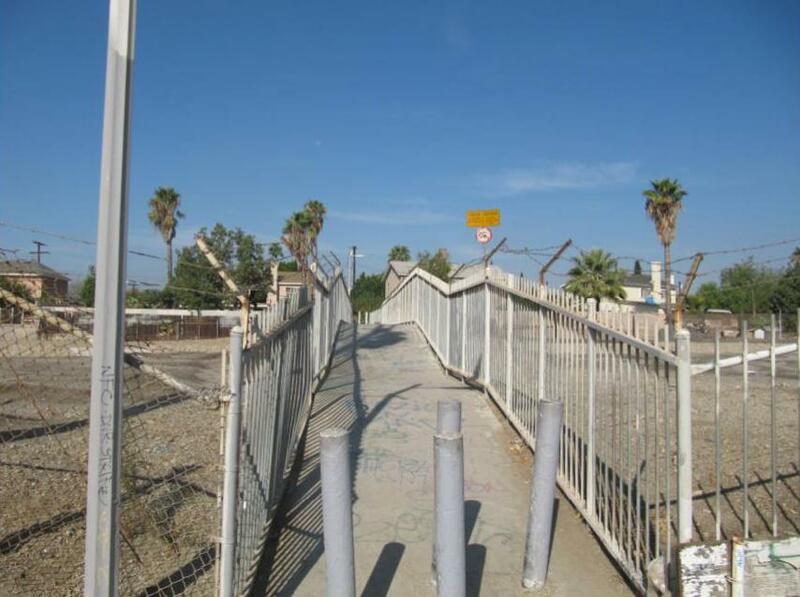 To support their efforts, the Pacoima Neighborhood Council donated $5,000 to maintain and clean the bridge and Scotts Miracle Grow donated mulch and soil. What a difference some paint, some plants, a minor investment in physical improvements and some public will can make. The gang members are gone, and so are the piles of trash. The bollards are now in compliance with the American with Disabilities Act and a wheelchair can glide across as easily as a bicycle or skateboard. Part of that de-mystification was getting the students from the high school involved from the outset, and keeping them involved until it was completed. In addition to stakeholder meetings with parents and local homeowners, Pacoima Beautiful led a mini-design charrette in the school to empower students and get their feedback. It was in these charrettes they first learned the plight of the student confined to her wheelchair and her harrowing commute. It was also in the charrettes where the students vetoed the idea of painting a mural because it would be seen as a challenge by the local gangs. Instead, the bridge was painted green, a neutral color not worn by any of the local gangs. When the students input was associated into the design, the next step was to actually implement it. A pair of service days (one in the fall and another in the Spring) were planned, one in conjunction with Mayor Antonio Villaraigosa’s office. Pacoima Beaufitul wored hard with the neighborhood council and their youth group (Youth United Towards Environmental Protection) and dozens of students showed up to paint, clean and help haul away the trash. A flower and plant garden was put where the trash was once dumped and later the bollards were replaced and even some light fixtures went in. The bridge was clean. The bridge remains clean. Its power is broken. The PLACE Grants were awarded by the L.A. County Public Health Department in 2008 to help communities create transportation and open space plans to get more people to do more things outside to combat the growing obesity trend in America and L.A. County. 29.5% of school age children in Pacoima are obsese, and one in every five has asthma. While the plan for the Wash is mostly about using the area to create usable open space, its also about change the Wash so that it is no longer a barrier splitting the community. On that front, this plan was an absolute success that both changed students walks and got the local community to think about the Wash in a different way. Residents living adjacent to the bridge are perhaps its biggest fans. “I love it,” resident Maria Barreda told the Daily News. Her neighbor on the other side of the pavement connected to the bridge doesn’t speak English, but just gave a thumbs up when I asked about the change in broken Spanish. “We got the biggest bang for the buck here,” Podemski added. But perhaps the biggest victory was just helping a young lady get across the bridge, the bridge that was blocked off with traffic bollards designed to keep cars off the bridge. Without any sort of cue from me, Podemski ended his interview by giving her story a happy ending. Or perhaps the biggest victory was that when students returned to school this fall, the bridge was in the same shape they left it last spring. Any graffitti has been covered, the greenery has been maintained and the lights all shine at night for any students walking home from a sport or other after school activity. The bridge remains clean. Its power is broken. Great work, Pacoima Beautiful! Thanks to Max and Lauren, and everyone who made this project happen and be successful! These are the real barriers in low-income areas that hold back people from walking and biking safely! Congrats, guys! Great job PB for putting in real work. Folks really need this in our communities and as a former High School student and bridge user I can definitely say that the physical improvements bring a bit of sanity to the morning walk. As for the gangs disappearing, I suppose a bridge beautification project would be sufficient for outsiders to think that’s all we need in the NE valle to distract youth from our broken school system and police intimidation. Granted the gangs are misdirected, but they have served as informal surveillance for many years. Lets see more physical AND social improvements in our communities. The Other Lesson of Our #LA2050 Listens Events. We Need to Get Younger People More Involved.